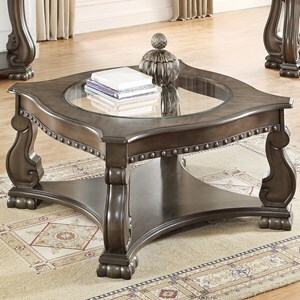 You'll love the rustic-industrial, almost western, atmosphere this Coffee Table will create in your living space. The piece's highlight is surely the set of wagon wheels that pair beautifully with the rustic wood finish and other metal elements, creating a genuine look. The Otis Wagon Wheel Coffee Table with Drawer by Crown Mark at Casa Leaders Inc. in the Wilmington, Long Beach, Torrance, Lakewood, Los Angeles area. Product availability may vary. Contact us for the most current availability on this product. Browse other items in the Otis collection from Casa Leaders Inc. in the Wilmington, Long Beach, Torrance, Lakewood, Los Angeles area.